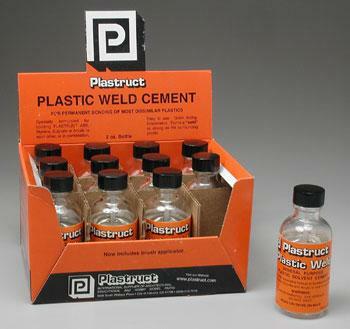 This is a Plastic Weld Cement from Plastruct. Retail $5.69 SAVE 16% ! Excellent for solid permanent joints. Perfect for attaching both Polystyrene and ABS together. The medium consistency gives you both time to position the parts and also give a bit of gap filling for joints with a slight miss match. The only con is that as the bottle empties the glue seems to thicken up bit, but that is sometimes an advantage. Used for bonding Plastruct ABS, Styrene, Butyrate or Acrylic to each other, or in combination. I was wondering if anyone can tell me if this model cement is the right choice for car kits. I&apos;m about to start a level 5 Volkswagen Bus kit, and wanted to know if the applicator brush would be ok to use. I hear good things about this cement used on military aircraft, tank tracks and other similar applications. Thanks for your help. "Here&apos;s another use for it"
An old school builder told me about this and I highly recommend it. Put about 1/2 oz. In a small glass jar, drop in a few small pieces of cut up sprue. Let sit about 24-36 hours ubtil the plastic melts,and you&apos;ve got some awesome body putty. Doesn&apos;t shrink, it&apos;s sandable and has same texture as the parts you&apos;re joining because it&apos;s made of the same plastic. Unused portion will keep for quite a while if you&apos;ve got it in a jar that seals tight. You can add more cement anytime to thin it too, or plastic to thicken it. Works excellent. physician, local emergency hospital or poison center.